Vacuum Sealers With Temp. Control. This special automatic constant heat sealer is excellent for sealing polycello films, humidity proof cellophane film, polyethylene film, aluminum foil coated bags and gusset bags. A beautiful mesh seal 15/10mm wide. 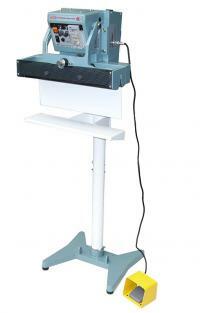 This sealer is especially ideal for packaging stuff like powder, liquid. Vertical sealing prevent stuff from overflow. Separate programmable timers for material thickness, sealing, and operating cycle.Foot switch included for manual operation mode. Equipped with mask preventing scald.